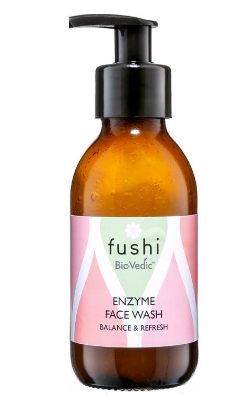 A nourishing face oil from Fushi to hydrate and revitalise your skin. 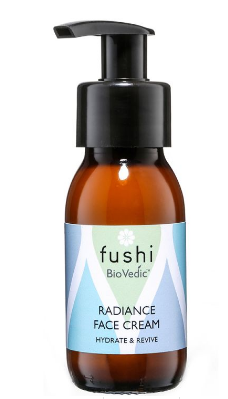 Fushi's Biovedic Radiance Face oil is ideal for dull, dry skin and fine lines. This lightweight face oil has been blended with 5 incredible nutrient dense oils including the protective Raspberry Seed, age-defying Kalahari Melon Seed, skin brightening Rice Bran and vitamin-rich Moringa among others. Infused with skin rejuvenating Ayurvedic herb Manjistha to deliver long lasting care and nourishment. It absorbs rapidly and leaves the skin supple, radiant and velvety soft. 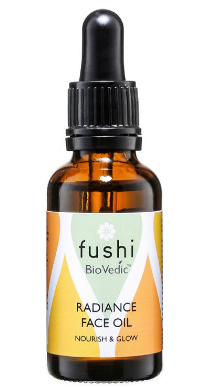 How to use Fushi's Biovedic Radiance Face Oil; Massage a small amount into face and neck morning and evening or add a few drops to your daily moisturiser for an intense boost of hydration. Ingredients; Adansonia Digitata (Baobab Seed Oil)+, Oryza Sativa (Rice Bran Oil), Simmondsia Chinensis (Jojoba Oil)+, Prunus Avium (Cherry Seed Oil)+, Moringa Oleifera (Moringa Seed Oil)+, Rubus Idaeus (Raspberry Seed Oil)+, Crocus Sativus (Saffron Flower) infused Cocos Nucifera OilF+, Rubia Cordifolia (Manjista) Herb infused Cocos Nucifera OilF+, Santalum Album (Sandalwood) Oil, Tocopherol 95%, Citrus Aurantium Dulcis (Orange) Oil, Pelargonium Graveolens Leaf (Geranium) Oil, Jasminum Officinale (Jasmine) Oil, Rosa Damascena Flower (Rose Otto) Oil, Benzyl Alcohol*, Benzyl Benzoate*, Citral*, Citronellol*, Eugenol*, Farnesol*, Geraniol*, Hydroxyisohexyl 3-Cyclohexene*, Limonene*, Linalool*. Packaging; Recyclable glass bottle. Check local recycling for the pipette dispenser.